We are continuing to find interesting new things in Glen Torridon. One of my favorite new images was taken this weekend (Mars sol 2356) on target "Stonebriggs" (pictured). We've seen round and smooth clasts before, but this area really stands out in how densely the clasts are packed together. Were these pebbles rounded by water during transport over a long distance? NASA's Mars rover Curiosity acquired this image using its Mars Hand Lens Imager (MAHLI), located on the turret at the end of the rover's robotic arm, on September 4, 2017, Sol 1806 of the Mars Science Laboratory Mission. 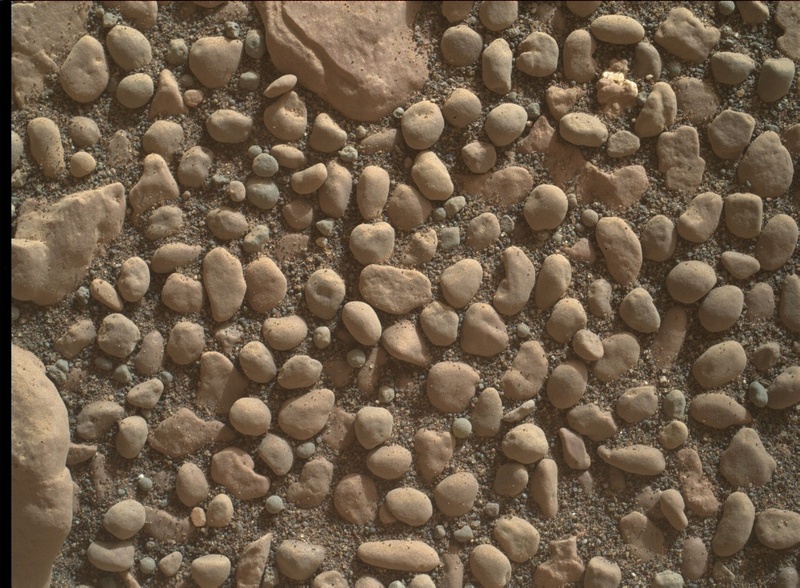 Or are they wind polished concretions similar to what we saw back on sol 1806? Or something completely different? There is a lot to talk about within the science team! Curiosity's workspace today looked more typical of what we've been seeing over the last few weeks. In today's plan, we will continue to drive towards an area we hope to drill. Before the drive on sol 2361, we will collect MAHLI and APXS data on a target named "Ardmillan," followed by ChemCam observations of Ardmillan, "Uyea," "Torry," and "Eorsa." We will also image nearby outcrops with apparent sedimentary structures named "Scolty Hill," "Midlothian," and "Dunans," as well as some sandy features named "Glamis." Finally, we take a full filter Mastcam observation of the nearby dark rock, "Eorsa," that we almost drove to last sol. On sol 2362, we will take a video of Phobos transiting the sun and a few ChemCam AEGIS observations. This image was taken by Front Hazcam: Left B (FHAZ_LEFT_B) onboard NASA's Mars rover Curiosity on Sol 2359.